Have you ever heard of the Mediterranean island nation of Malta? 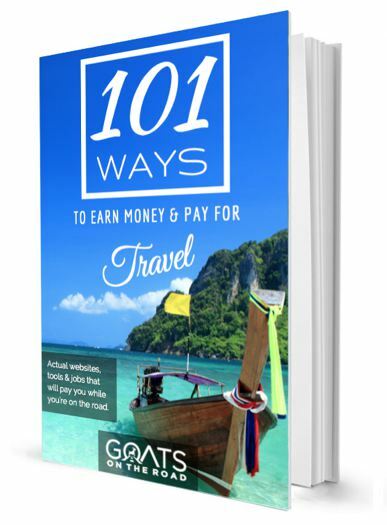 This is a country that both surprised and delighted us during our travels through Central and Eastern Europe. 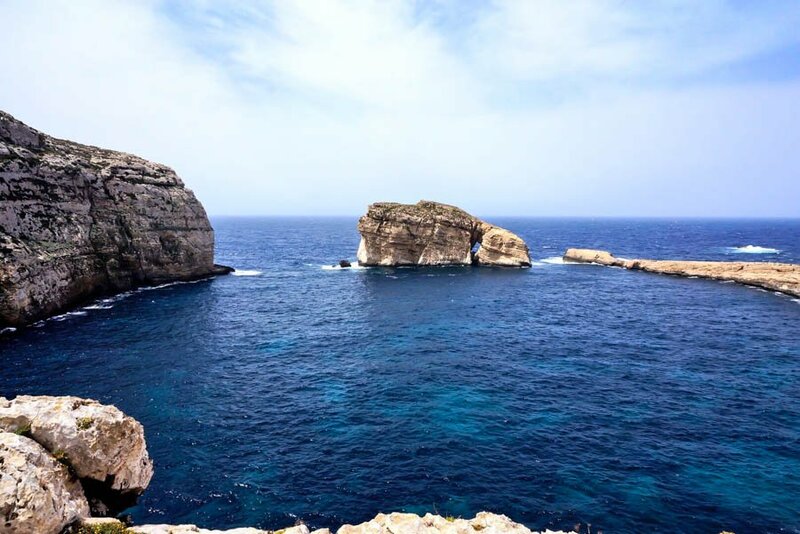 After doing some research we soon realized that: 1) There wasn’t much information available online from other travellers, and 2) Malta sounded like a place we could definitely stay awhile! 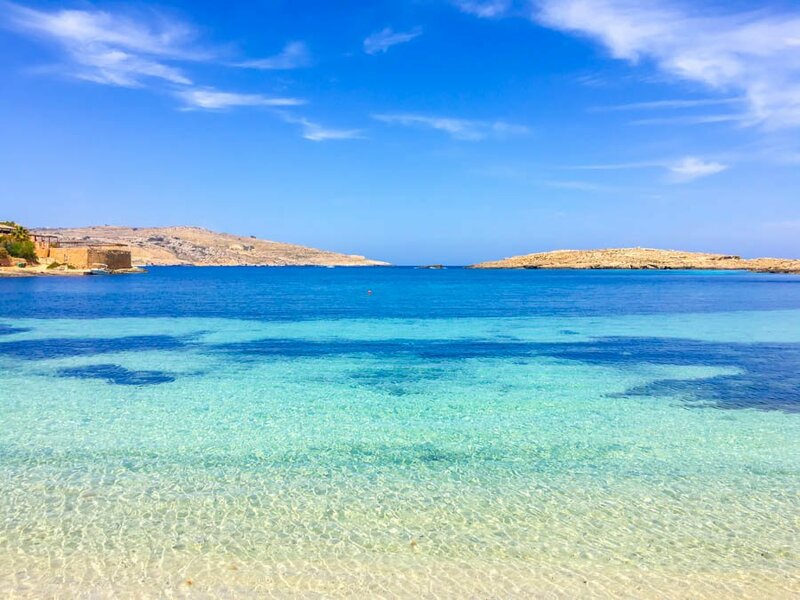 We booked an apartment and spent two months exploring and learning about this unique archipelago, which has three inhabited islands: Malta, Gozo and Comino. With one of the best climates in the world, endless water and land activities, an interesting and complex history, and a wonderful blend of European, Italian, African and Arabic cultures, Malta truly has it all. 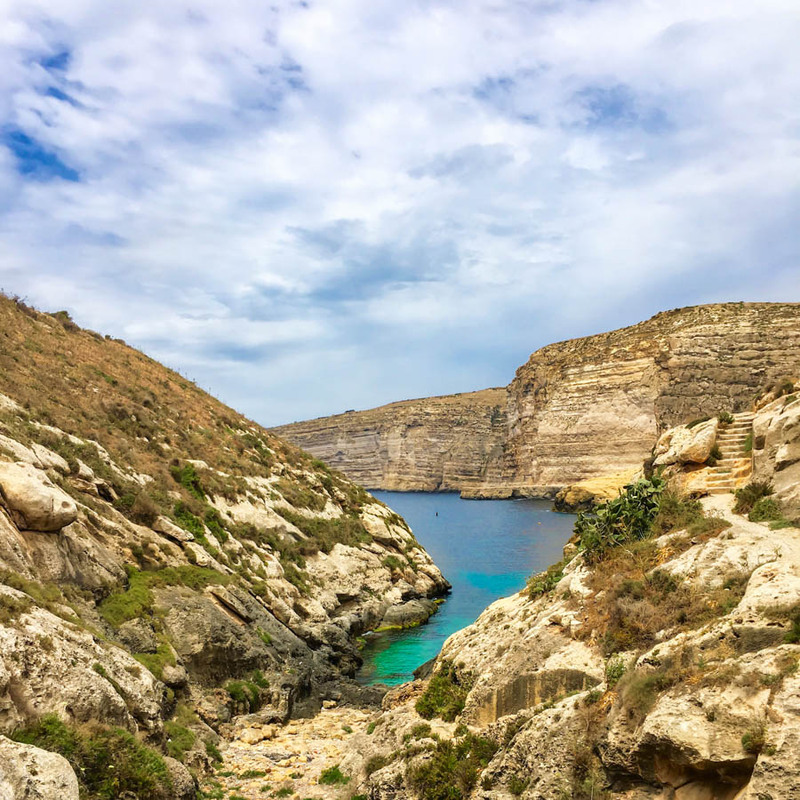 Here are 21 of our favourite photos from Malta, Gozo and Comino that will inspire you to visit! Valletta is the capital city of Malta, and it’s definitely one of the most beautiful cities we’ve ever seen. These traditional Maltese balconies are found all around the island, with a large concentration of them in Valletta. 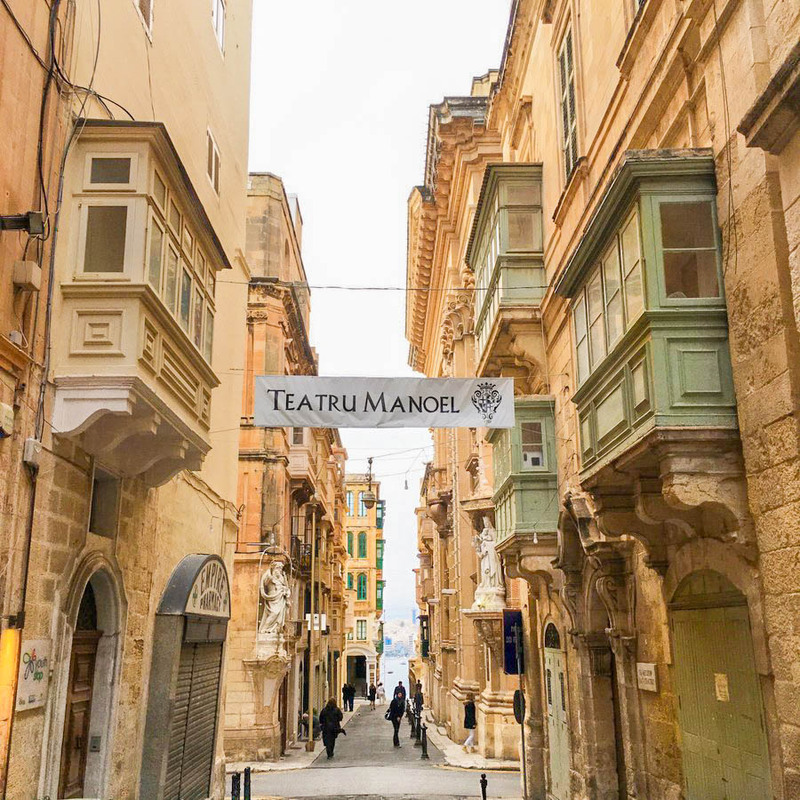 The Teatru Manoel (Manoel Theatre) is one of the oldest working theatres in all of Europe. If you have a chance to visit Malta when there is a show going on, try to get yourself some tickets, the acoustics inside are outstanding. 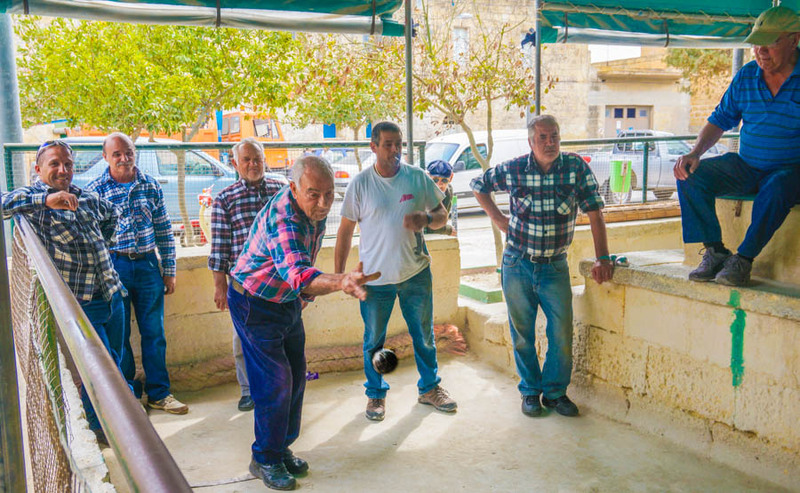 Bocci is a popular pastime for the men of Malta and Gozo. We came across these guys having a game and they invited us to stay and watch. We didn’t fit in though, I think you need to wear a plaid, flannel shirt to be a part of this team! Be prepared – the people of Malta and Gozo are extremely friendly. A drone’s eye view of the back of the Basilica of Our Lady Mt. Carmel in Valletta, looking across the water towards Sliema and Gzira. 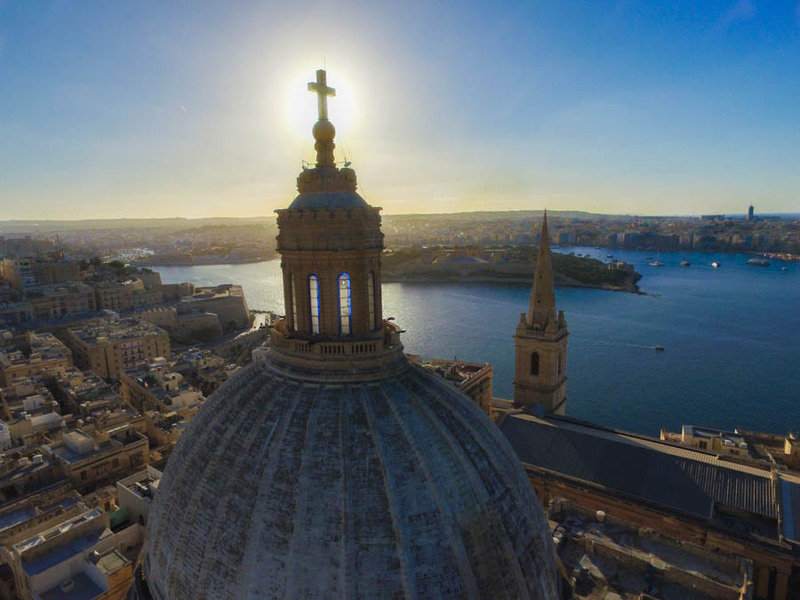 We were actually in Sliema when Nick flew the drone across to get this photo – pretty cool. The Blue Lagoon is a natural wonder of the Maltese archipelago! To get here you can take a day trip from Malta, or you can kayak with Gozo Adventures from Mgarr like we did. The lagoon is a very popular spot, and even though it can be crowded, it’s most definitely worth a visit. 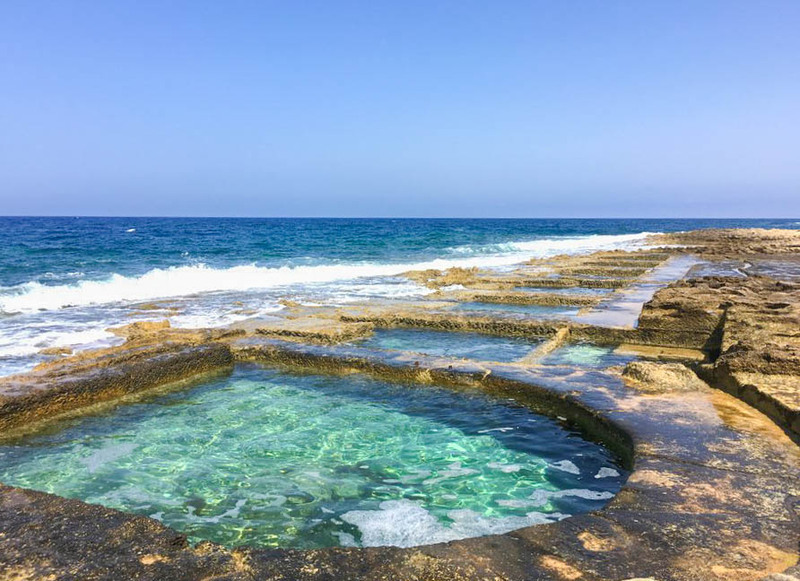 These manmade, rock-cut swimming holes are located in Sliema just below the promenade. These are from the Victorian era and were once covered with canopies so that the female bathers could have some privacy. 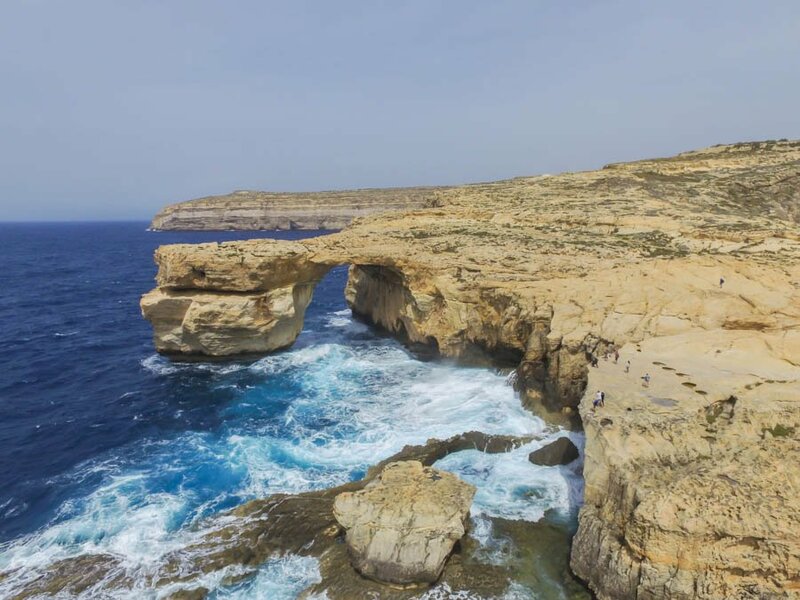 The Azure Window is found on the island of Gozo. 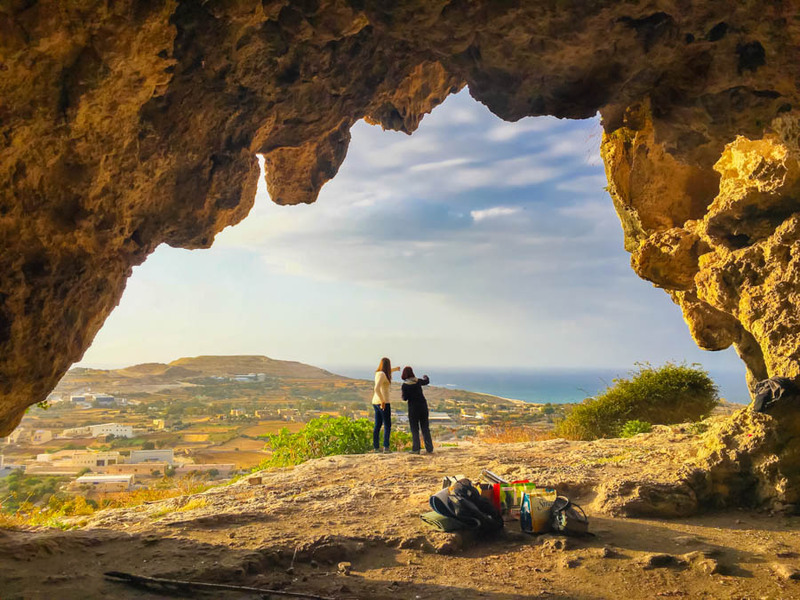 Visiting this natural site is definitely a highlight of a trip to Malta. This natural archway in the rocks was the backdrop of one of the Game Of Thrones episodes in season one. The blue hole is also found here, which is an excellent dive site. The swimming off the rocks in Sliema is awesome. Because the shoreline from St. Julian’s to Sliema is rocky, rather than sandy, the water is crystal clear. 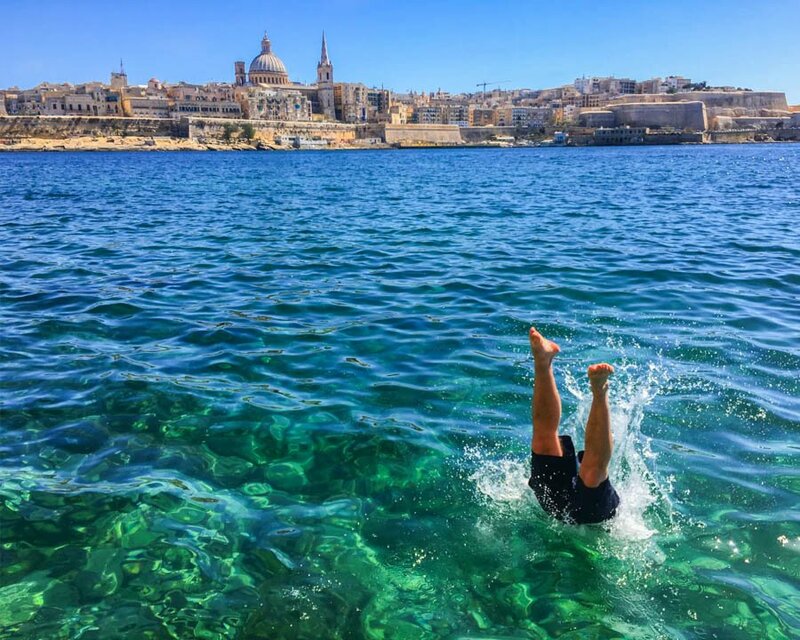 Swimming with a view of the UNESCO listed city of Valletta is pretty awesome. 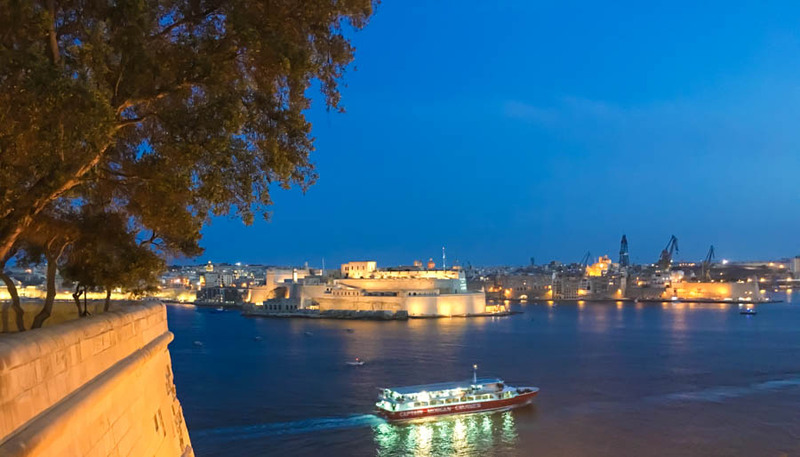 The fortified cities of Birgu, Senglea and Cospicua are dubbed the “3 cities of Malta”. Birgu is the oldest, while the other two were founded by the Order of St. John in the 16th and 17th centuries. 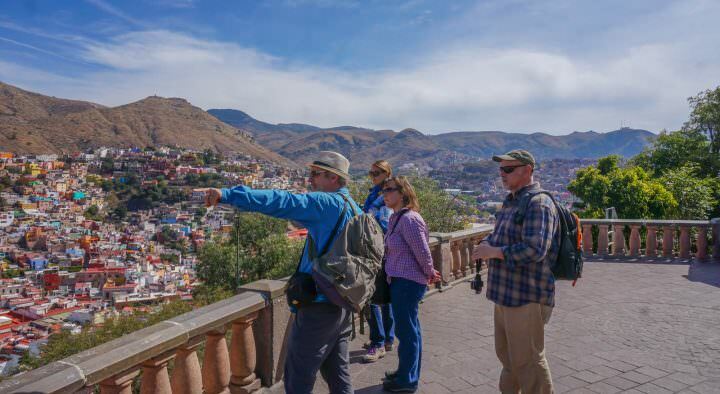 You can visit these three beautiful cities by boat, or arrive by bus and explore on foot. 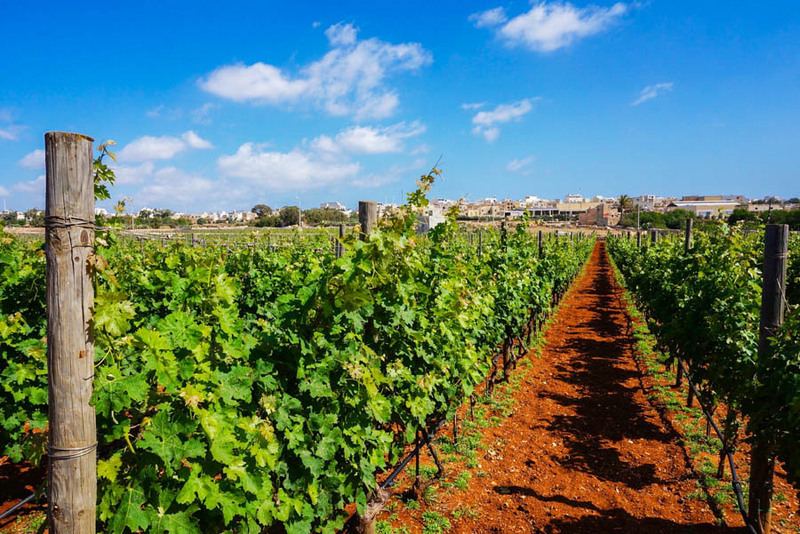 Did you know that there are wineries in Malta?! Although not as internationally famous as its Italian neighbours to the north, the wine in Malta is very good. Check out the Marsovin Estate and cellar – make sure to sample the Primus, it’s one of the best red wines we’ve had. This is the gorgeous Baroque style Church of St. John the Baptist, also called the Rotunda of Xewkija. This church dominates the village of Xewkija in Gozo, which is where we spent 3 nights. 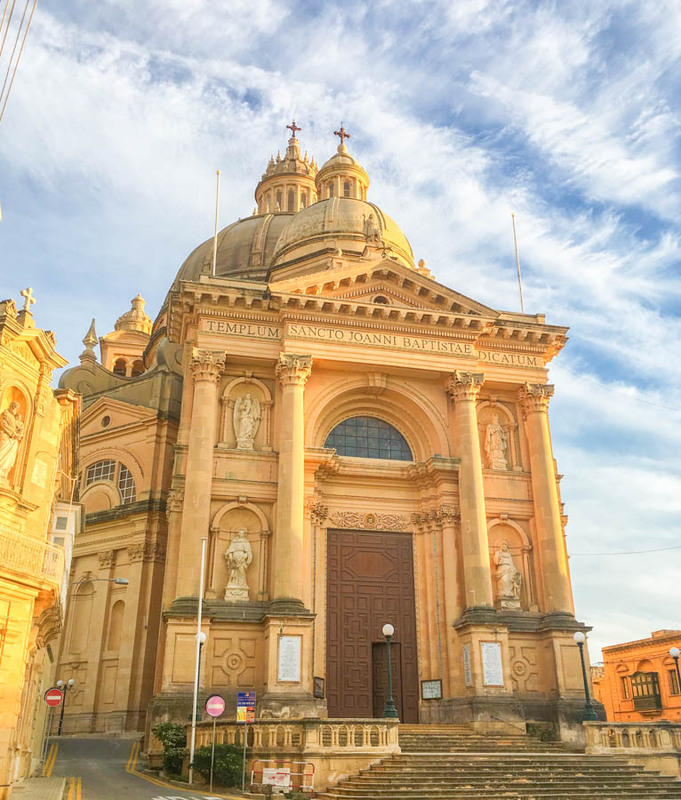 There are 359 churches in Malta – 46 of which are found on Gozo. Maltese (and Gozitans) are so hospitable and welcoming! We met some amazing people who soon became good friends of ours. They showed us to this secret cave where we BBQ’d and enjoyed the sunset. Getting off the beaten path in Malta is possible, and recommended. The Victoria Gate was built by the British in 1885, and is named after the Queen Victoria. 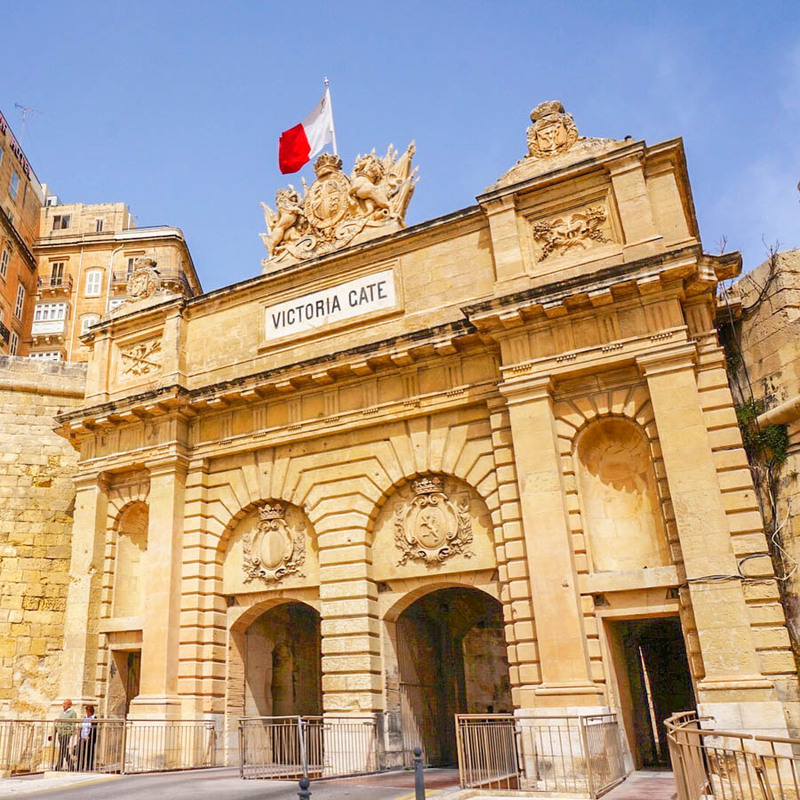 This gate is the main entrance from the Grand Harbour into fortified Valletta. The other gates were destroyed during the 19th and 20th centuries. Maltese cuisine is a wonderful fusion between the traditional island food, and influences from the various civilizations that occupied the islands. 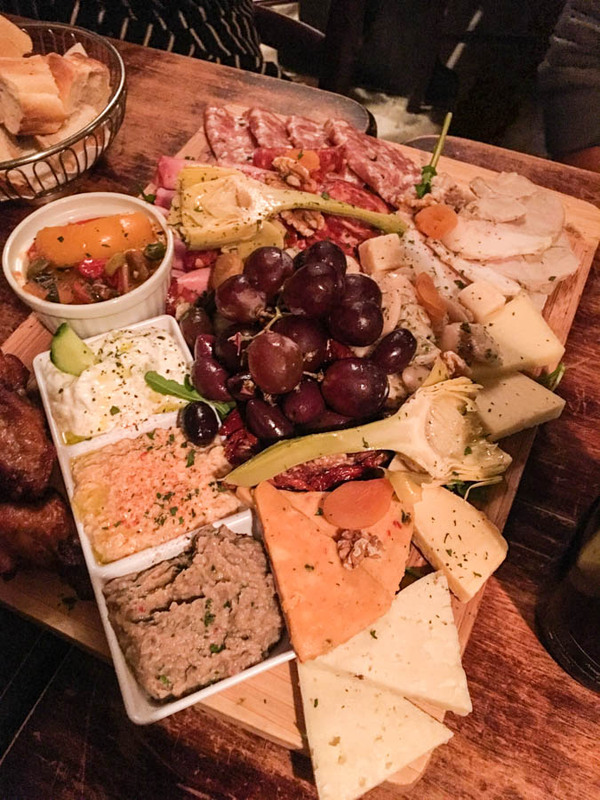 Platters are a common dish to share among a group of friends at a restaurant, or bar. Typically you’ll find a wide variety of cheeses, broad beans, birgila (broad bean pâté with garlic), sun-dried tomatoes, bread & olive oil, meats, and grapes. Delicious! This is the incredible view looking across the Grand Harbour to the three cities. The view is from the Upper Barrakka Gardens, which are beautiful public gardens in Valletta. Sunset time in Sliema. This rocky area is set directly on the water, just a couple of minutes walk from where our apartment was. 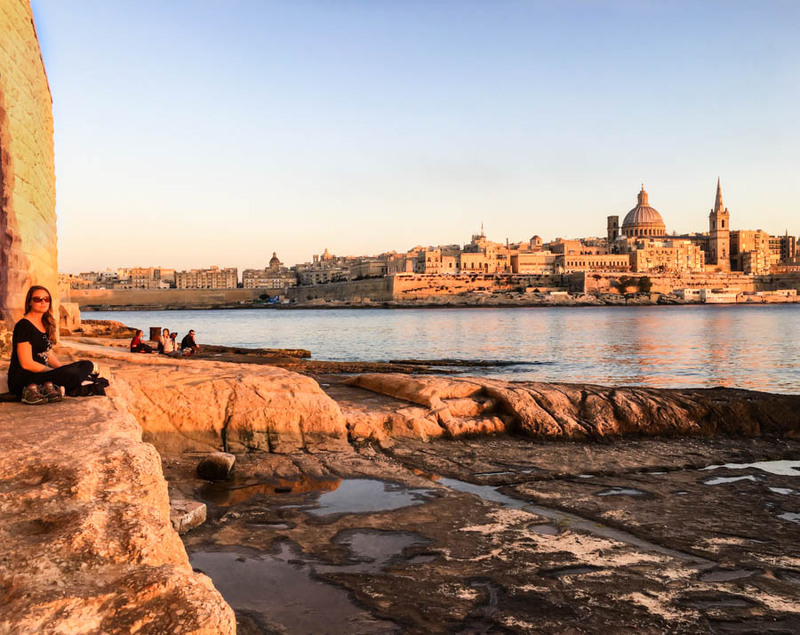 These rocks have the best view during sunset, when Valletta takes on a beautiful golden hue. The scuba diving around Malta and Gozo is incredible. 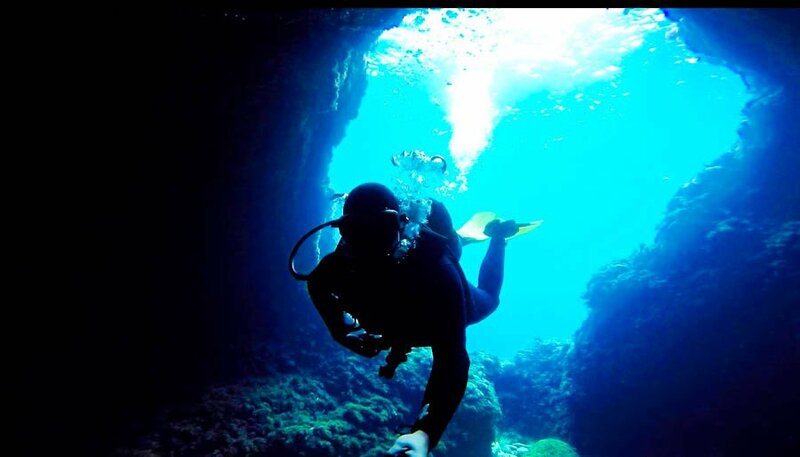 You can explore shipwrecks and reefs, but the main draws here are the rock formations below the water, the narrow tunnels, and of course, the Blue Hole. The walled medieval city of Mdina is one of the most amazing places in Malta. By day the labyrinth of alleyways are alive with people, while at night, the city empties out and the golden lamps are turned on. 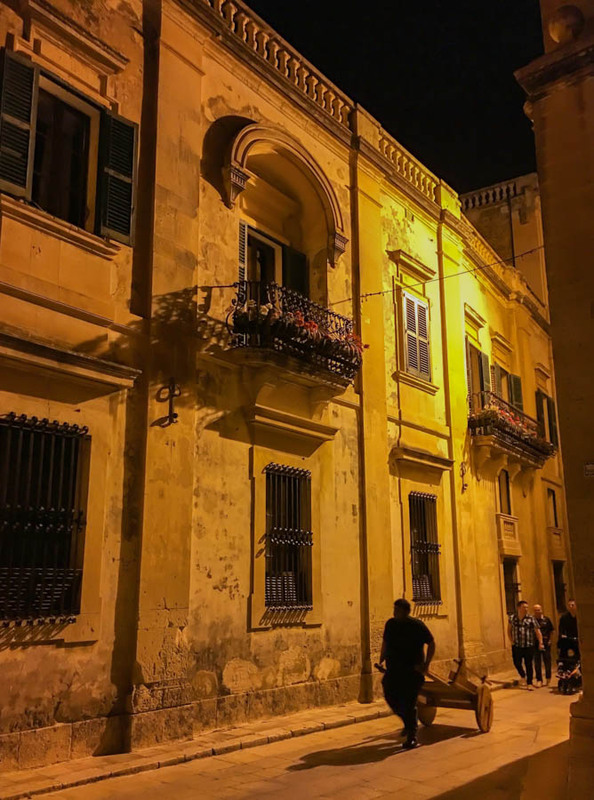 The “Silent City” is definitely worth visiting both during the day, and at night to experience both sides of Mdina. This is Fungus Rock, which sits at the mouth of Dwerja Bay on Gozo Island. It’s 60 meters high, and is made of limestone. The name Fungus Rock comes from a smelly plant that grows here, which was used in the past to cure dysentery. These days, this bay is an excellent snorkelling spot and the views from above the bay are spectacular! 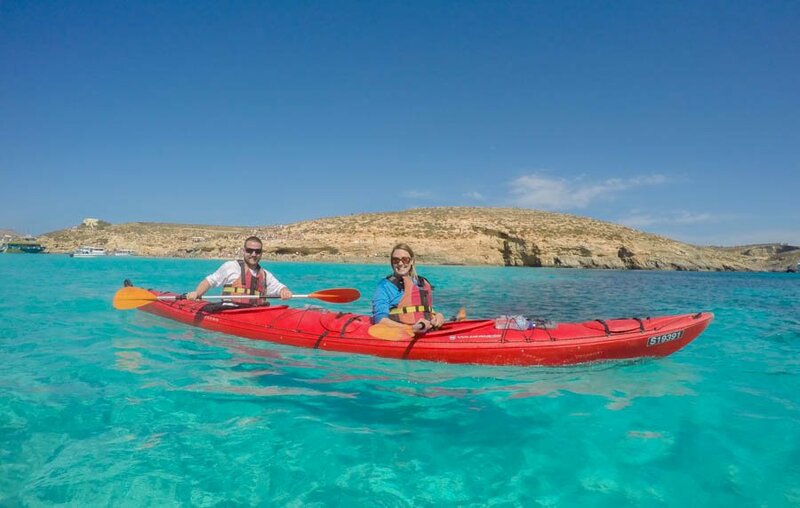 Most people know about the famous Blue Lagoon at Comino Island, but if you decide to go kayaking from Gozo, you can stop off here at the beautiful Santa Maria Bay! Even if you only stop at the Blue Lagoon, you can walk for about 30 minutes to reach this beach. 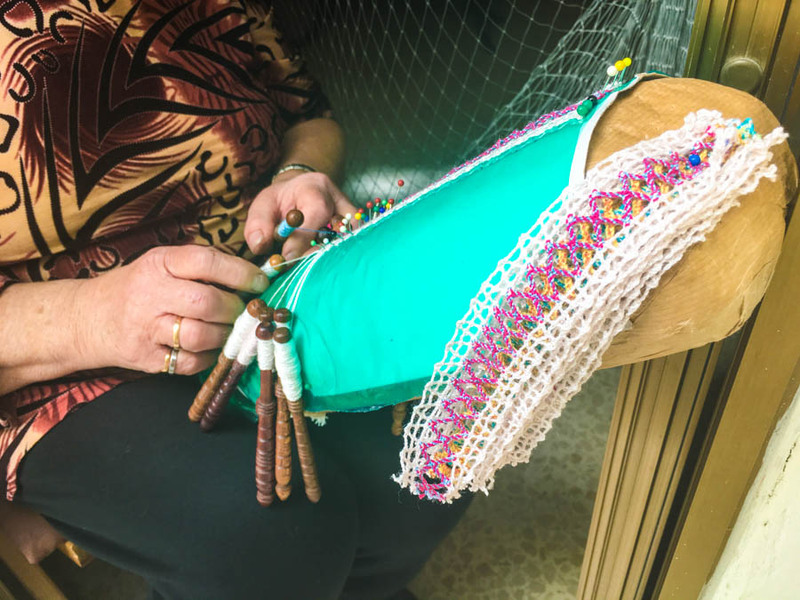 Lace-making (bizzilla) in Malta and Gozo dates back to the Knights of St. John, when it was used as a fashion accessory. These days, the people still pride themselves on their lace-making abilities – which is fascinating to see. You can spot women sitting in their doorways, enjoying some people watching, while creating bracelets and other items. 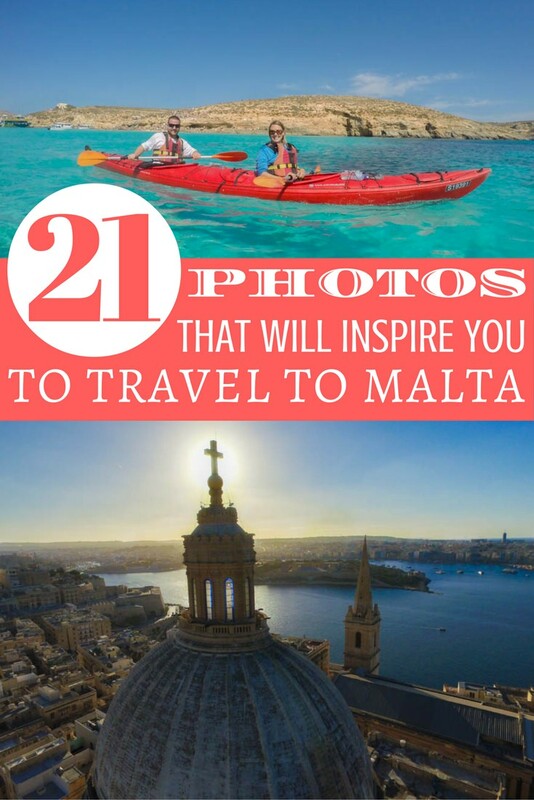 Hopefully these 21 photos will inspire you to visit Malta. This is truly one of the most underrated countries we’ve been to. For more information and articles on the country, click here to see our posts. These photos absolutely make me want to go to Malta. My favorite is the one in the cave with the sea in the background! Thanks Stef! I hope you get to visit someday soon, Malta is wonderful! Wow Malta seems amazing! So stunning. That scuba diving through the rock formations sounds really cool. 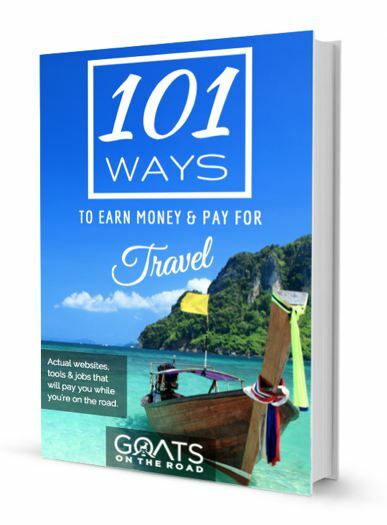 I did one like that in El Nido and would love to do one again! 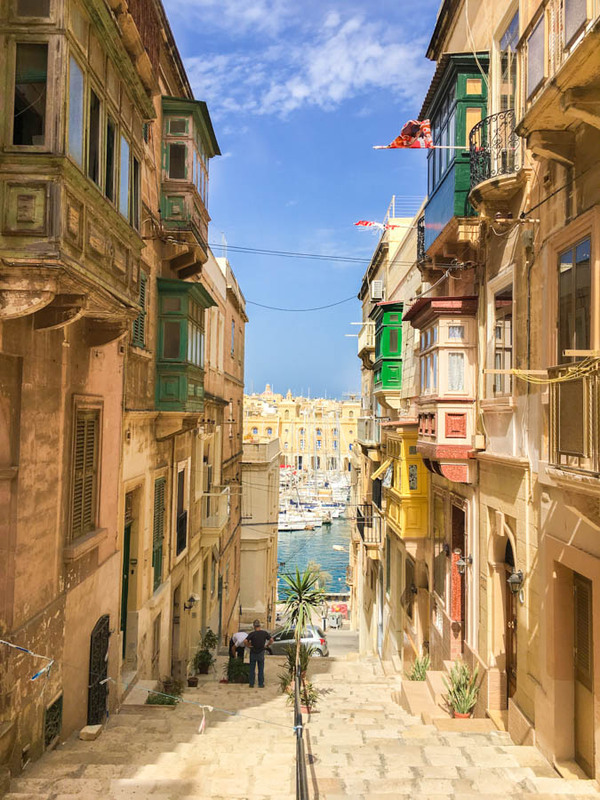 I’ve heard so man good things about Malta, but we’ve never visited – it’s definitely on our to go list though (although admittedly, that list is still pretty big!!). I hadn’t really thought about diving in Malta but it sounds like an amazing place to dive – yet another reason to go! And we are big Game of Throne fans – would love to visit some of the filming locations! I’m surprised that Malta is not that well known for tourists. It was and maybe still is, a favorite place to keep expat families for those of us who were working in Mr Gadafi’s Libyan oil fields. One ofthe neatest things I remember, was running our pail down on a rope to the street from our balcony, to send money for wonderful loaves of fresh bread , pedalled in the street by horse cart. The Black Gold pub in Sliema was our most favorite hang-out. 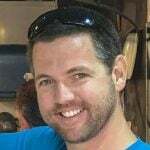 Apartments can get very uncomfortable in winter with no means of heating. We had a small ‘parafin’ portable heater(kerosene).Maltese love their horses (mostly Arabians I believe) and i recall going to sulky races there. Kids start so early in school that I recall some were still carrying and sucking on baby bottles (TRUE! ).Our son was in school there at 3 or 4. Good luck to all who go there.! Beautiful Place .NO Green Grass! We made special trips to the ‘Four Seasons’ to see and admire their front lawn. Hi Bill! I can’t imagine what Malta was like when you were there. I would love to send money down in a pail and receive some fresh bread in return! So cool. And you’re right, that’s one of the very different things about Malta…no green spaces! Malta is very dry during summer but as from November till March the countryside is very green. Most tourist visit Malta in summer but it is much nicer in late Autumn and winter. ABSOLUTELY amazing! These photos are stunning! 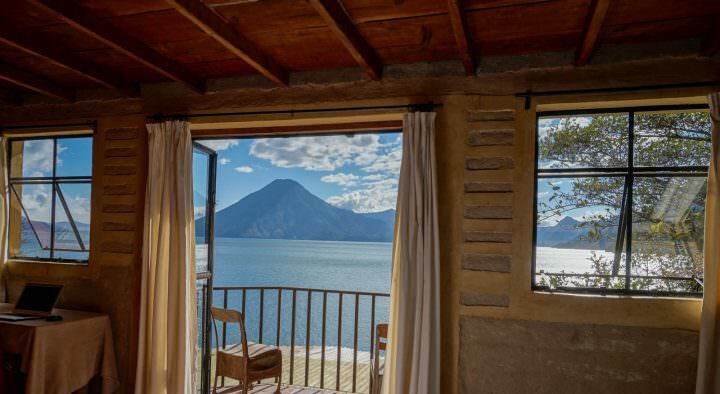 It looks like a phenomenal place to visit! Amazing! My boyfriend and I going to Malta in March. I saw you picture with drone? everybody needs to visit Malta, the food is very good, the natives are very friendly and welcoming.